Detective Ben Russo is in trouble. He just can’t remember why. When a car accident lands Ben in the hospital, he can’t recall anything about his life. What he does know is he’s enchanted by a tiny nurse named Tess, but can’t shake the feeling they’re both in danger. After being left at the altar, Tess Jansenn moves to a new town and starts over. When her ex-fiancé, Ben, shows up in the ER where she works with no memory of her, she must decide – tell Ben who he is or let him remember on his own. Can Tess forgive and forget what drove them apart, and when Ben remembers, will the consequences of his choices make it too late for love? Tess Jansenn is finally moving on after ex-fiance, Ben Russo, abandoned her just before their wedding. That doesn’t mean she’s over Ben, and he surely never stopped loving Tess. When Ben shows back up mysteriously, she must choose whether to turn her back on him or help, and that wasn’t an easy choice. “I believe we meet God in places that aren’t always buildings. For me, sometimes church is out there.” She motioned to the water with her chin. 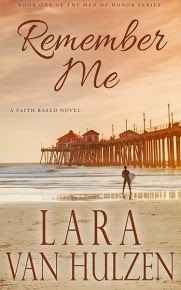 Remember Me is Lara Van Hulzen’s debut novel, and I LOVED it! I’m already tapping my foot, waiting impatiently for the next one, Get to Me, which I was thrilled to discover will feature Dane and Aimee. I dug into Remember Me at the start of a six hour drive to visit our son, and didn’t stop devouring it until the last page. It was that good! Disclaimer: I purchased a copy of Remember Me. The opinions expressed in this review are my own, and I received no monetary compensation.